Chef Justin is one of the Dream Team of Vineyard Chefs delivering the amazing al fresco dinner at the Cool Chardonnay World Tour Tasting & Dinner on Saturday, July 21st. Justin grew up in the small town of Vineland, exploring all the town had to offer to inspire his childhood adventures. He began his dream of becoming a chef as a young child watching his mother, a pastry chef, following her around in fine dining kitchens across the Niagara Region. He began his career at Vineland Estates Winery in the summer of 1999, starting as a kitchen steward, watching the chefs around him. The following year, he enrolled at Niagara College in the Chef’s Apprentice Program. As the years passed, Justin climbed the ladder from kitchen steward to Chef de Partie. In 2002, Mark Picone, the former executive chef at Vineland Estates Winery, gave Justin the opportunity to do a six month stage in Colle Di Val D’Elsa, Italy, at Arnolfo Ristorante, a two star Michelin rated restaurant. During his time in Italy, he gained insight to classical Italian cuisine, which he uses to this day. Shortly after his return to Canada, Justin attained his Red Seal Certification, and was promoted to Sous Chef at the winery, making him responsible for managing staff and for sourcing local ingredients to create the seasonal menus. 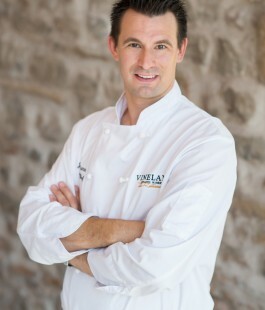 In April of 2011, Justin accepted the position of Executive Chef at Vineland Estates Winery. His new focus will be on strengthening his relationships with local farmers and purveyors to create regionally sourced menus that attract the culinary adventurers in all of us.